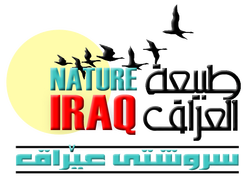 Nature Iraq is an Iraqi non-governmental organization registered in Iraq, accredited to the United Nations Environment Programme (UNEP) and Iraq’s first and only Affiliate to Birdlife International, and the only Middle Eastern member of the Waterkeeper Alliance. Improve the capacity of Iraq's institutions to protect its environment including local and national governmental and non-governmental bodies, along with universities, colleges, and scientific institutions. Develop a scientific database of environmental conditions and trends within Iraq through environmental monitoring and research programs focusing on water resources, ecology, and biodiversity. Encourage environmental awareness and stewardship of Iraq’s environment by promoting community-based environmental centers and clubs, developing environmental education programs in Iraq, and maintaining global awareness of Iraq’s environment. Promote the sustainable use of Iraq’s environment and resources, respect and balance the traditional use of the environment by indigenous inhabitants, preserve wildlife and biodiversity, and address the economic needs of both local inhabitants and the nation. We foster dialogue and decision-making through consensus. We maintain a separation from political, ethnic and religious factions. We respect cultural diversity and traditional knowledge. We follow international guidelines and conventions for environmental restoration. We focus on local capacity building of existing and emerging Iraqi institutions. We collect and use the best scientific information available. We encourage local stewardship and work to engage indigenous inhabitants in planning projects and decision-making.